KA-BAR 1283, 1282 D2 Extreme Fighting/Utility Serrated Edge Knife FREE SHIPPING! When standard quality is not enough and "better than average" still falls short, there is only one brand to turn to and that is KA-BAR. The D2 Extreme Fighting/Utility Serrated Edge Knife delivers the strength and power that others do not. A full-tang runs through the entire handle, eliminating weak connection points and chances of snapped handles. The blade is forged from high-carbon, high-chromium D2 steel that delivers incredible resilience for a long lasting edge that can handle endless days in the field. A Kraton G® polymer surrounds the solid steel tang, for a secure grip able to withstand even the harshest conditions. The handle is textured and ergonomically shaped with dual handguards that improve blade control while offering the hand protection needed in close quarters battle (CQB) situations. KA-BAR meets the 21st century. Very pleased with the quality and strength of this knife. Proudly made in USA. 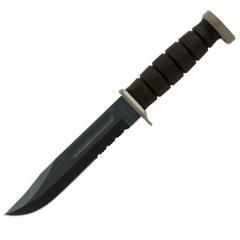 ©2002-2019 CopsPlus.com: KA-BAR 1283, 1282 D2 Extreme Fighting/Utility Serrated Edge Knife FREE SHIPPING!